An Army sergeant who described killing an AK-47-wielding 10-year-old boy in Iraq during a talk at a Cape high school last month admitted yesterday he fabricated the story, a military spokeswoman said. Sgt. Dennis Edwards is accused by his military superiors of making “false statements about his experiences in Iraq and Afghanistan” and could be charged, said Maj. Amy Hannah, spokeswoman for his division, the 82nd Airborne. “Sgt. Edwards has admitted that the statements made concerning the 10-year-old child were not true,” Hannah said. The 23-year-old Barnstable High School graduate said he and two other soldiers shot and killed a 10-year-old who approached their base in Iraq pretending to have a wounded leg, then pulled an AK-47 and started shooting. Afterward, he said, they found C-4 explosives strapped to the child’s body. Yesterday, Hannah said there is no evidence that the shooting incident occurred. Edwards told the story in response to a question while speaking to about 95 students during a question-and-answer session at Dennis-Yarmouth Regional High School. He elaborated on it during subsequent interviews with the Times. His comments were included in a Times story about his talk published Nov. 24. After his superiors learned of his published comments criticizing the president, Edwards was counseled by his commanders about what he can and cannot say in public, Hannah said. But Edwards’ commanders took stronger action when they accused him of making up the story about the 10-year-old enemy combatant. The “chain of command” will decide what, if any, disciplinary action Edwards might face for the false statements, Hannah said. He could be charged under the Uniform Code of Military Justice, the code of conduct for military members, she said. The circumstances surrounding Edwards’ comments about the boy remained under investigated late yesterday afternoon. It had not yet been determined exactly what action may be taken against Edwards. He could face administrative, nonjudicial or judicial penalties, Hannah said. He could also receive only counseling, or no punishment at all, she said. 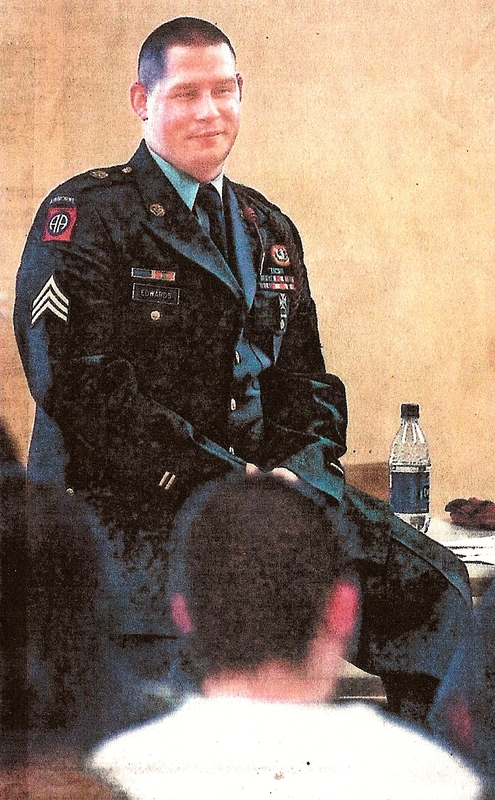 Edwards returned to the United States in March after tours in Iraq and Afghanistan. He is based in Fort Bragg, N.C., with his wife and two young sons. He was on leave visiting family when he spoke to students at the invitation of Wayne Bergeron, a teacher at the high school. Bergeron also said that other things Edwards spoke about, such as his comments about a lack of proper military equipment in Iraq, were backed up by media reports about the war. Edwards spoke with a Times reporter several times after his talk at the high school but has had no communication with the Times since Saturday. He did not respond to a message left at his North Carolina home yesterday, nor to several interview requests since Monday. His military lawyer advised him not to talk to reporters, according to his family. His mother, Edna Marceline of West Yarmouth, said last night that he had not spoken with her yet about the Army’s statement that he fabricated the story about the 10-year-old boy. Edwards’ superiors called him Nov. 29, while he was still on the Cape on leave, and ordered him to report back to the base by 5:30 a.m. the next day, he said Saturday. On Tuesday, Hannah told a Times editor that Edwards claimed he never told the story about the 10-year-old boy during his talk at the school. Edwards claimed the story was inaccurately attributed to him and that his younger brother, a D-Y student who attended the session, may have told the story. But a local weekly newspaper that covered Edwards’ talk also quoted him telling the story about the 10-year-old boy, something his superiors discovered only yesterday. At least one military expert said yesterday he would not expect formal disciplinary action to result against Edwards for fabricating a story. “Lying in uniform as a public speaker is reprehensible, and certainly to be discouraged,” said Eugene R. Fidell, a lawyer and visiting lecturer on military justice at Harvard Law School. Meanwhile, Edwards has also taken heat for airing his political opinions in public. He has been “counseled” on what he should and should not say in public and to the press because of statements he made criticizing President Bush and the for going to war in Iraq, Hannah said. Edwards portrayed the Iraq war as a flawed policy undertaken for the wrong reasons. Edwards said Saturday that the quote landed him in “a lot of trouble” after his superiors read it in the Times. The issue was whether Edwards violated Article 134 of the Uniform Code of Military Justice by making “disloyal statements,” his mother said Monday. Marceline said then that her son feared he would be demoted from sergeant to private, lose pay, and possibly even be discharged from the Army. That infuriated Edwards’ aunt, Barbara Marceline of South Dennis, who contacted the Times Friday. How, she said, could a soldier who served in two war zones lose everything for an opinion? But Hannah said Edwards had not been charged for his political comments. Usually a public affairs officer talks to soldiers about what they can and cannot say in public, before they speak, she said. Edwards never received the training, she said. An Associated Press reporter asked his opinion of the war, and Plummer said he didn’t agree with it. After the comment was reported, the Navy charged him with making disloyal comment, according to an accountwritten by his father, Lou Plummer, and published in The Sun Herald of Biloxi, Miss. Plummer was found guilty and demoted, his father wrote. “Service members have little, if any, First Amendment protections when it comes to matters involving the president of the United States and in essence the chain of command,” said David Sheldon, a Washington, D.C.-based lawyer who represents members of the military worldwide. Marceline said her son loved the Army. She said he went into it straight from high school because he wanted to be like his grandfather, who served in the 101st Airborne. He even used his grandfather’s jump log to mark down his leaps from airplanes. The 82nd Airborne Division is considered an elite part of the U.S. military. Created in 1917 as an infantry division nicknamed the “All-Americans,” the 82nd became the first airborne division in 1942. Since then, the 82nd, with its 14,000 paratroopers, has been engaged in nearly all U.S. military action overseas, including the most recent deployments to Afghanistan and Iraq. Edwards re-enlisted with the 82nd last year and planned to stay in the Army until at least 2007.